← Erythrina velutina: A Leguminous Anxiety Cure? Galphimia Plants: Mood Elevating Goodness? The mood elevating effects of Galphimia glauca have been investigated in animal models. In one study, researchers administered Galphimia glauca to mice who where then exposed to experimental stress. The results of the study showed that various concentrations of extracts of Galphimia glauca were effective at significantly reducing the anxiety experienced by the mice. In animal models of mood disorders, Galphimia glauca has also been shown to increase sleeping time in mice and to reduce the stimulant effects of drugs. Animal experiments confirm that that the anxiolytic effects of extracts of Galphimia glauca may relate to the presence of galphimines in the extracts. Pharmacological studies have investigated the kinetics of galphamines and shown that they are absorbed to the blood and then subsequently cross the blood brain barrier in animals models using rodents. Therefore compounds in Galphimia glauca may act directly on the central nervous system and cause changes that may improve mood. Galphimia glauca contains a group of triterpenes called galphimine, and of these graphamine B B has been shown to be the most bioactive form. 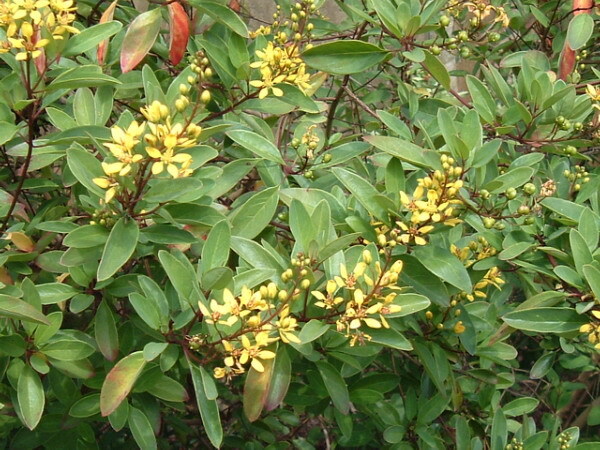 However, Galphimia glauca may contain a number of other chemicals that could explain its mood elevating effects. In particular, studies have shown that aerial extracts of the plant contain the flavonoid quercetin and the phenolic acids gallic acid and gentisic acid. Evidence suggests that galphimine B interacts with the dopaminergic system without activating the GABAA receptor. However, other studies have shown that flavonoids including quercetin my activate the GABAA receptor. There is an intriguing possibility that extracts of Galphimia glauca may therefore have multiple mechanisms of action in the central nervous systems of mammals. In a human study, researchers administered extracts of Galphimia glauca standardised to contain 0.175 mg of galphimine B to patients suffering from the generalised anxiety disorder (GAD) for 15 weeks. The results of this study showed that the Galphimia glauca extracts were able to reduce the anxiety scores of the patients to a greater extent that compared to the benzodiazepine drug lorazepam. Further, the authors noted that the Galphimia glauca extracts showed no problems with tolerability or toxicity. Image from: CC BY-SA 3.0, https://commons.wikimedia.org/w/index.php?curid=52007. Human studies have also been performed to investigate the mood elevating effects of Galphimia glauca. In one such study, researchers administered Galphimia glauca extracts to individuals who were diagnosed with suffering from the generalised anxiety disorder (GAD) for 4 weeks. The results of the study showed that the aqueous extracts of Galphimia glauca displayed significant anxiolytic effects in the subjects, and the authors noted that these effects were similar to the benzodiazepine drug lorazepam. The authors also noted that the Galphimia extracts showed significantly greater tolerability compared to the lorazepam. The extract used in this human trial was a standardised extract of Galphimia glauca, containing 0.348 mg or galphimine B. Therefore extracts of the aerial parts of Galphimia glauca appear to be effective in the treatment of generalised anxiety disorder (GAD), and this may relate to a non-GABAergic mechanisms of action that may involve modification of the dopaminergic system. This entry was posted in Anxiety, Depression, Galphimia Glauca, Mood. Bookmark the permalink.